Students often struggle with the jump from 1 variable situations to 2 variable situations, i.e. functions. Visuals are an effective way to present concepts which may be abstract, e.g. functions. Graphs and visuals in general are designed to allow a big picture view of a concept. The photo above shows mileage and price for Honda Odyssess vans collected in January 2012. The work is from a student who has a non-verbal learning disablity (basically a mild version of asperger’s). Students are first asked to identify the van with 66,000 miles and that costs $21,000. This ensures they understand what is presented. Then they are asked a leading question about mileage and price (#3). 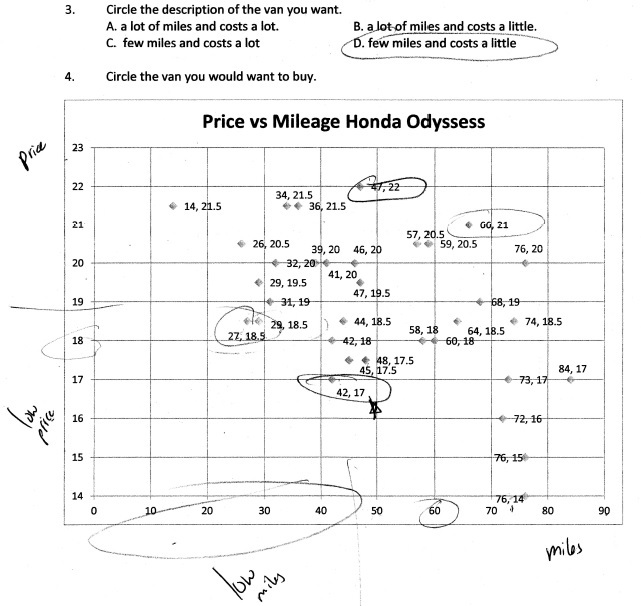 Finally, in question 4 they are asked to use the graph to draw a conclusion – choose the best van (based on mileage and price). This leads into a discussion about the relationship between mileage and price (you can see notes I wrote on the graph to facilitate this). The photo below shows four scenarios and one of four graphs students are to use for matching. For the first graph students were to determine that the graph best models the US economy (problem given in 2013). Over the past few years the economy dropped rapidly but has been improving since. This student (same as the one identified above) identified one aspect of the graph – the recent rise. Breaking a graph down into parts and comparing the parts is an example of Bloom’s analyze level. By justifying his choice of C this student was evaluating. 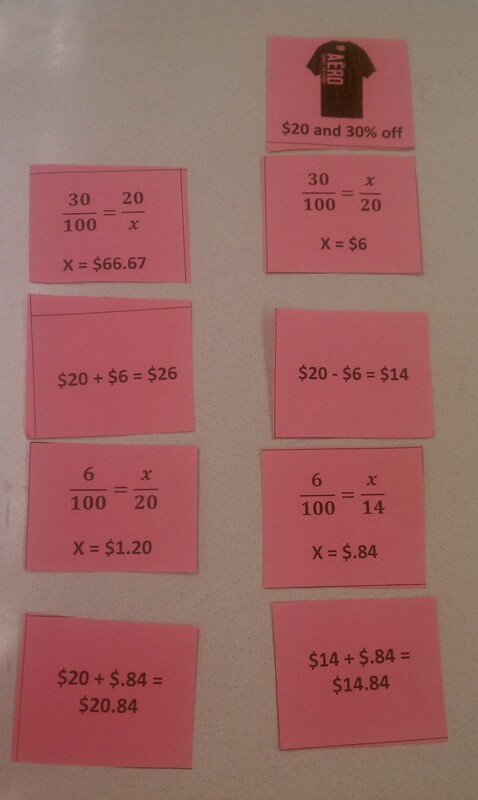 This is a photo of matching cards for the topic of percent discount and percent tax. Students are given a card with an item to buy, a percent discount and our state tax rate of 6% (not listed). We’ve identified 4 steps for to find the total amount to pay the cashier: compute discount, compute new price, compute tax, compute the total cost. There are two cards for each step, one that shows the step completed correctly and one with an incorrect step. Students are to identify the correct steps and arrange them in order. This activity is useful for a variety of reasons. By having the steps listed there are no calculations. The students can focus on the steps and the concept. To figure out the correct order students engage in higher level thinking. They analyze and justify their choices. Because the problems are worked out and students simply focus on choosing cards they can do much more on their own. This is engaging. While they are engaged the teacher can circulate and ask leading questions. It can be very surprising how poorly understood discount and tax can be for students yet most have bought something and paid tax, even items on sale. As such this is an important topic. The questioning approach I used was to ask open-ended questions and follow up or leading questions, e.g. 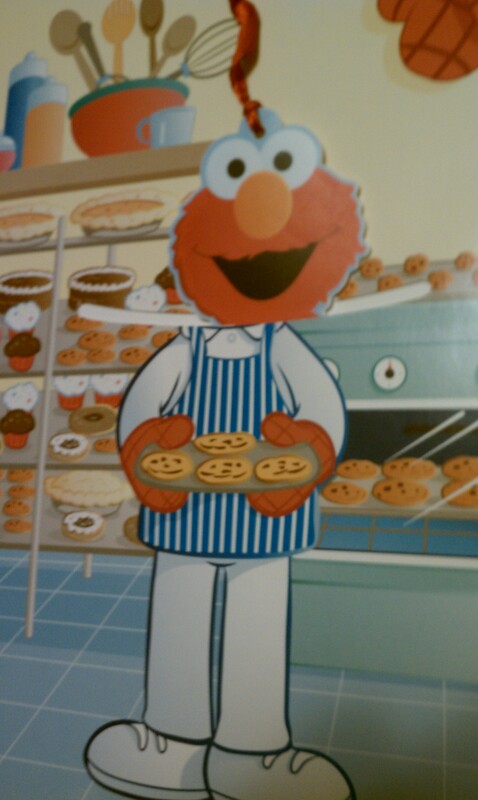 “how do you know he’s a baker?” This approach works at all ages but is probably more common at earlier ages. 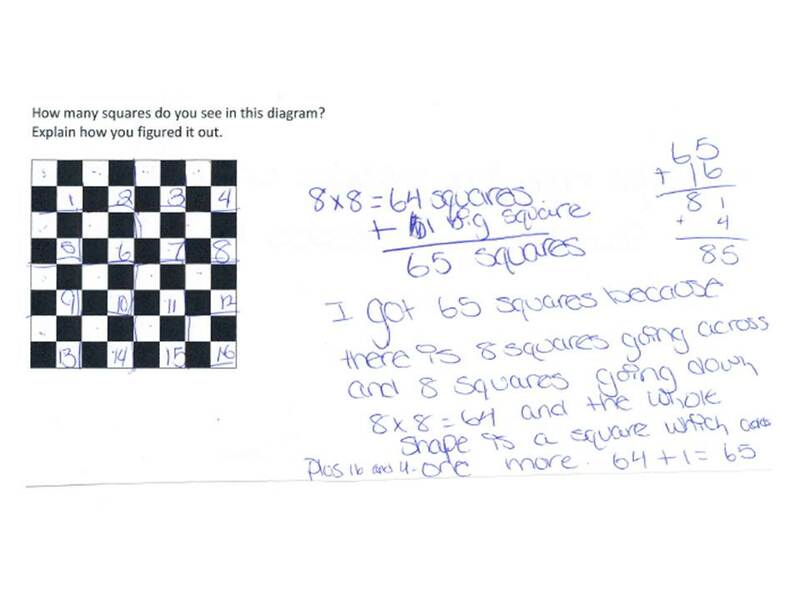 What I have found is that students progress through school learning that math questions are typically right or wrong with little critical thinking. Students are afraid to answer questions because it’s all or nothing. On another post I address how we can shape critical thinking and this questioning is another approach. I have a video showing this questioning of my son on youtube. 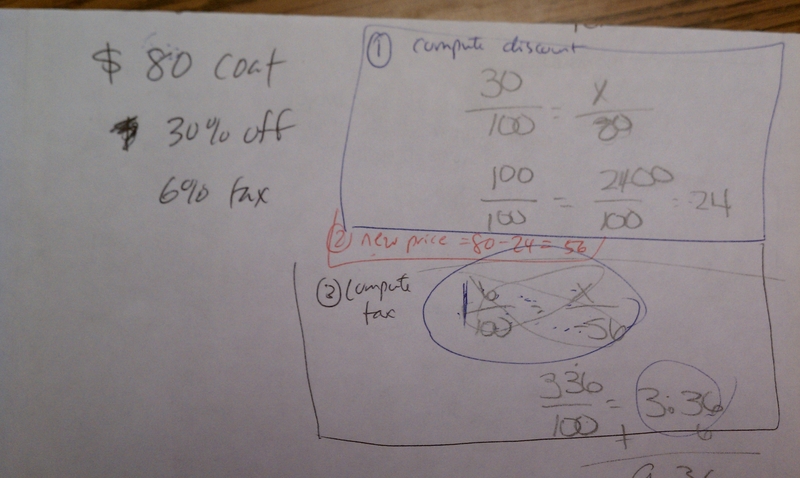 I gave a student a pop quiz on percent change – find discount and tax – after she completed independent practice on this objective. The student followed the steps very well, as you can see in the photo (I added the ink later) up to the very end. At that point she added the tax to 6 for a total cost of $9.36 – good deal for an $80 coat! This is hardly uncommon if not typical in education both at the secondary and post-secondary level. The focus is largely on steps and not concept building. I asked her follow up questions (as opposed to telling her what to do to fix it) to flesh out the concept. “What did you do first and why?” “What does discount mean?” “What did you do here (pointing to the 6/100 part)?” “What do you pay the cashier?” She was confused because she wasn’t thinking real life situation but got caught in the weeds of the math steps. What do you notice in this painting? Write any ideas at all on your own paper. Guernica is a painting by Pablo Picasso, in response to the bombing of Guernica, Basque Country, by German and Italian warplanes at the behest of the Spanish Nationalist forces, on 26 April 1937, during the Spanish Civil War. Guernica shows suffering people, animals, and buildings wrenched by violence and chaos. The overall scene is within a room where, at an open end on the left, a wide-eyed bull stands over a woman grieving over a dead child in her arms. The centre is occupied by a horse falling in agony as it had just been run through by a spear or javelin. It is important to note that the large gaping wound in the horse’s side is a major focus of the painting. The bull’s tail forms the image of a flame with smoke rising from it, seemingly appearing in a window created by the lighter shade of gray surrounding it. Under the horse is a dead, apparently dismembered soldier; his hand on a severed arm still grasps a shattered sword from which a flower grows. A light bulb blazes in the shape of an evil eye over the suffering horse’s head (the bare bulb of the torturer’s cell.) Picasso’s intended symbolism in regards to this object is related to the Spanish word for lightbulb; “bombilla”, which makes an allusion to “bomb” and therefore signifies the destructive effect which technology can have on society. To the upper right of the horse, a frightened female figure, who seems to be witnessing the scenes before her, appears to have floated into the room through a window. Her arm, also floating in, carries a flame-lit lamp. The lamp is positioned very close to the bulb, and is a symbol of hope, clashing with the lightbulb. From the right, an awe-struck woman staggers towards the center below the floating female figure. She looks up blankly into the blazing light bulb. Daggers that suggest screaming replace the tongues of the bull, grieving woman, and horse. A bird, possibly a dove, stands on a shelf behind the bull in panic. Shaping is a term in special ed which basically means to train a student to incrementally follow through on a sequence of substeps to accomplish a task. B.F. Skinner coined a different name for this which he called operant conditioning. The top photo below shows “Skinner’s box.” The pigeon was placed in the box and when it pecked at the metal wall a pellet of food was presented to it. Eventually the reward was given as the pigeon pecked closer and closer to the disk in the wall where its beak is in the photo. 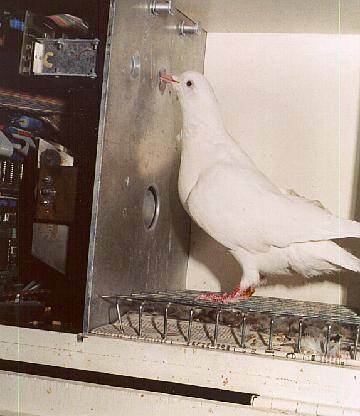 Finally, it learned that by pecking this disk was the only means of getting the pellet. In special education, this shaping is used to train a student to achieve specific outcomes. In the bottom photo below my son Gabriel is playing with his favorite all time toy, Legos. As is the case with many with autism, he would not look at people in the eye. 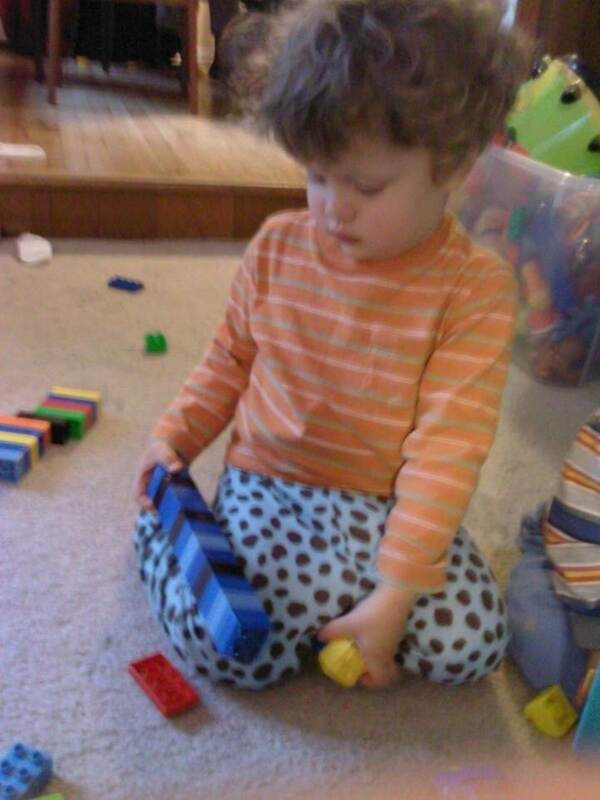 His therapists trained him to make eye contact by first holding his Legos in the air until he requested them. Eventually the Legos were held incrementally closer to the therapist’s eyes. The second to last step was to hold them next to the eyes and finally he had to look into the therapist’s eyes before getting the Legos. This same approach can be used to train students to attempt problems, think critically, follow classroom norms such as the appropriate steps for starting classs and any other desired behavior. Below is an example of a puzzle I use to train students to make an effort and to think about problems. I have found that many students not only have a learned helplessness when it comes to math but they have been trained to follow steps mindlessly. Following a task analysis approach the first step is for students to find an entry point to a problem. They also need to feel comfortable taking risks. Slowly moving the students towards solving more complicated problems is called shaping. Below you can see that the student made a more simplistic attempt. Given that this was done the first day of school I was very pleased with the effort. I wrote in another post about a 7th grader with asperger’s who tested in math at a 1st grade or kindergarten level. I used scaffolding to show him how to do Sudoku puzzles. On the left is a simple version with one digit missing from the box. In the middle is a little more complicated scaffold. On the right is a completed Sudoku puzzle that this student completed on his own (minimal prompting). These worksheets come from http://www.superteachersworksheets.com.